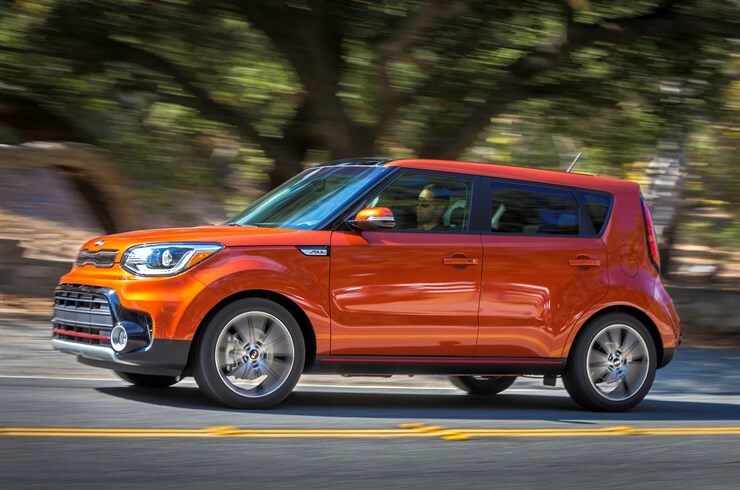 It’s hard to make something great even better, but Kia did when it added a 201-horsepower turbocharged engine to one of its best-selling, most-iconic and most beloved vehicles. Fans of the Soul had long lobbied for a little more zip in their favorite ride and the 2017 Soul Exclaim didn’t disappoint when it was revealed to media at the LA Auto Show this year. The Exclaim also gets a standard leather-wrapped, D-shaped steering wheel, pushbutton start with smart key and UVO32 with e-Services with integrated Android Auto™3 and Apple CarPlay ™.4 A thumping 315-watt Harman Kardon®5 premium audio system with eight speakers, including a center channel and subwoofer, navigation and 8-inch touchscreen display is also available. Other new options for the 2017 model year are convenience systems such as Rear Cross Traffic Alert and Blind Spot Detection are also available6. The 2017 Soul is available in three trim levels: Base with manual or automatic 6-speed transmission; Soul Plus with the 6-speed automatic; and the Exclaim turbo with the new 7-speed DCT. There are also two new exterior colors. Redesigned headlights and fog lights, along with front and rear fascias lend a more aggressive appearance while the availability of two dedicated USB charge ports and an 8-way power passenger seat add convenience and comfort.